Chiva-Som is a “Haven of Life” on the Gulf of Thailand. The Chiva-Som philosophy is about learning to live, enjoy and appreciate every moment, and in so doing, creating a personal path to health and wellness. 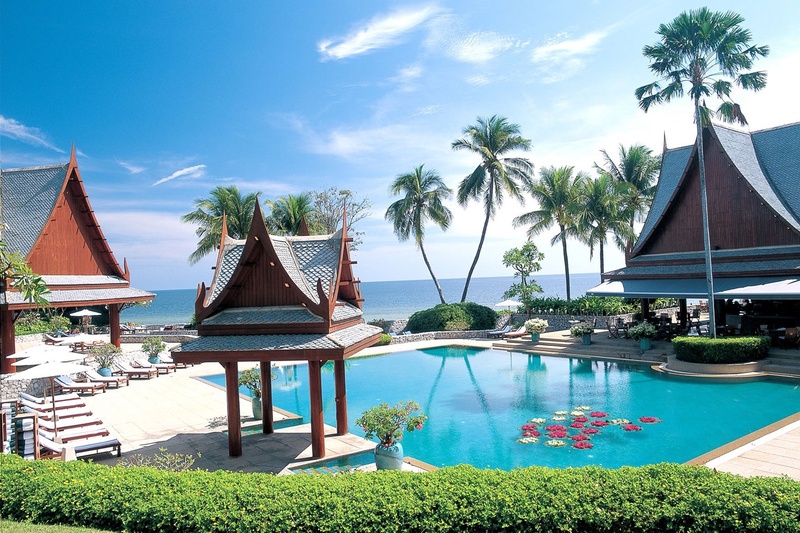 Nestled within seven acres of lush tropical gardens, the beachfront health resort represents tranquility at its best, with luxurious accommodation providing spectacular views of the Gulf of Thailand. In addition to 70 treatment rooms, spa facilities include a kinesis studio, gym, watsu pool, flotation pool, large outdoor swimming pool, bathing pavilion with kneipp bath, sauna, steam, jacuzzi, and indoor swimming pool. At the Niranlada Medi Spa you’ll find a plethora of treatment rooms with doctors and dermatologists on hand offering a wide range of aesthetic and anti-ageing medicine and treatments. Laser treatments, micro-invasive cosmetic surgery, Botox and Thermage are all on offer. 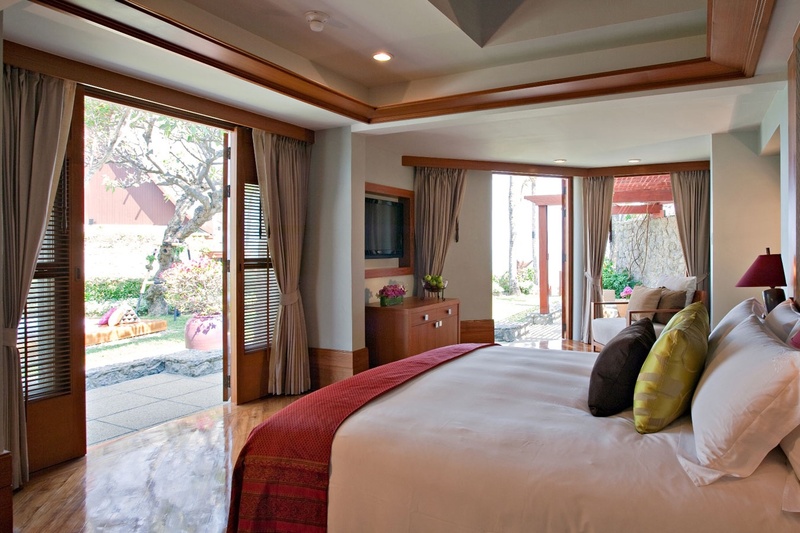 The 58 rooms and suites span the resort offer luxury and comfort with fittings and features providing a perfect balance between Thai architectural beauty and Western standards. From marble bathrooms to Thai sculptures and individual DVD players in each room, your creature comforts are taken care of. 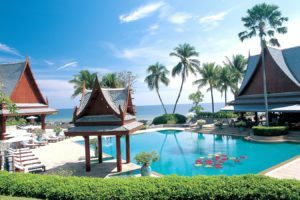 Three Spa Cuisine meals per day are served up at Emerald Restaurant – offering International spa cuisine – and Taste of Siam Restaurant where Traditional Thai spa cuisine is served by the beach. Under 16s are not permitted at Chiva Som. Two and a half hours drive from Bangkok airport. Private Chiva-Som limousine transfers available. There is something about the traditional Thai salutation I find mesmerising. Upon crossing someone’s path, you smile and greet them with warm eye contact and gently bow your head with your hands pressed together as though in prayer. It acknowledges others respectfully and nudges you to abandon the million-and-one other thoughts coursing through your synapses. In many ways it’s exactly like Chiva Som. Situated on a long beach in Hua Hin district, this holiday resort-come-health spa makes you acknowledge your surroundings, live in the present, slow down and smell the lotus flowers. Be prepared to abandon your mobile, disown your laptop and shun your camera. Even tablets and kindles are kindly forbidden in communal areas, so I had been warned. At first, panic set in. What? No food images to upload to Instagram? No timeline of my daily events to be posted on Facebook? I felt my thumbs clambering for something to do. But within no time at all I was eternally grateful to the powers that be at Chiva Som for enforcing this gadget free space. Chiva Som is an escape in every sense of the word – and it has to be experienced in the now. What do you get when you cross a five star spa and a five star hospital? You get Chiva Som’s incredible spa facilities. In fact, Chiva Som IS a registered hospital, but cleverly disguised beneath a beautiful painted veil. Dotted around the holistic spa area are male and female water therapy suites, saunas, a steam room, Jacuzzi – and wonderful heated waterbeds to relax pre or post treatment. In the Niranlada Medi Spa you’ll find a plethora of treatment rooms with doctors and dermatologists on hand offering a wide range of aesthetic and anti-ageing medicine and treatments. Laser treatments, micro-invasive cosmetic surgery, Botox and Thermage are all on offer here. With over 150 treatments and specialist practitioners that include doctors, nurses, US-trained dermatologists, plastic surgeons, naturopaths and therapists, it’s easy to get overwhelmed, but not for long. The softly spoken staff mesmerise you into a warm cocoon of serenity. My non-invasive Laser Skin Rejuvenation began with a spray of mist to cool and protect the epidermis – the skin’s surface layer. Then a painless laser energy pulsates through the epidermis to the layers of skin where collagen is formed. This triggers a repair mechanism, and your body begins to rebuild and replenish its own natural collagen. This treatment is actually quite relaxing and it really works. After a couple of days I noticed a HUGE difference in my skin – brighter, lifted and glowing – I’m a laser rejuvenation convert! No matter which programme you choose there are three complimentary treatments. Try the Stress Therapy Release, the Flotation Tank or The Signature Massage (during which my therapist Pim rectified 41 years worth of aches and pains). After relaxing on one of the heated waterbeds and sipping Chiva Som’s signature drink of lemongrass tea, it was time to meet my consultant. The consultation seemed quite clinical, but it made sense once I discovered that here, they focus on your greater well-being, with programmes and treatments for everyone from weight management, detoxification, optimal fitness and stress reduction to skin rejuvenation and longevity. The packages are many, I wanted them all, so help in choosing which one is right for you is appreciated. A lengthy questionnaire revealed my short and long term needs, for me it was the Emotional Wellbeing Retreat. Created for guests who feel over-stressed or lack energy, the retreat is designed to rejuvenate the mind, body and spirit. The holistic approach of the programme includes acupuncture, mind and body therapy, a healthy regime, regular fitness and a stable sleeping pattern. The Fitness team here at Chiva are amongst the most enthusiastic, experienced personal trainers I have come across, and I know quite a few! Given that exercise is one of the most effective ways to alleviate tension, there’s no flopping about here. The gym is state of the art, featuring over 30 different training regimes, like a Hypoxic room (where the oxygen is lowered to ensure your heart works harder), GRAVITY 500 – a type of high intensity tabata style training, and EMS (electro-muscular stimulation) where you wear a bodysuit that is connected to electric current, and as you train your muscles are worked harder via the current. In conclusion – part holiday destination, part spa and part hospital. My prescription? Large doses of meditation, seclusion, fitness, sleep, pampering, delicious and nutritious cusine, and endless amount of time on the massage table. Now if only they would offer a repeat prescription! On The Weight Management Programme a personal trainer will work one-on-one with you to help balance physical activity in conjunction with a supportive diet. Each programme is tailored to your needs to promote an end result that not only achieves weight loss, but also provides you with valuable knowledge and understanding to continue a healthier, sustainable lifestyle. We stayed in one of the Thai Pavilions, where traditional Thai style buildings are set in beautifully manicured gardens dotted with ponds, waterfalls, and an outdoor Sala sitting area. One of the options given to you before check in, is a Butler Service. This involves someone unpacking the contents of your suitcase, and hanging your floaty dresses, to allow you the time to nibble the ultra healthy snacks which adorn the mini bar, or peruse the pillow menu! No matter which type of accommodation you decide on one thing is for sure, you are destined for a deep slumber and very sweet dreams here, especially after a day at the spa. The food here is yet another reminder that your health and well-being are in good hands. Every dish is made with health in mind, and comes with a little note about it’s calorie content as well as the protein, fat and carbohydrates levels – allowing you to take as little or as much as you want. I felt genuine empathy for those guests who chose a juice diet – as the each dish was more delicious than the last. The menus at the restaurants – one Western and one Thai – are refreshed daily. For breakfast, try the quinoa and sweetcorn porridge made with pumpkin seed milk 83kcal or the Chiva Som eggs benedict 90 kcal. Another winner is the sweet potato bread, which, once again debunks the myth that healthy food is bland. Lunch choices could be anything from pan fried pomfret with bok choy and caper sauce – a mere 105.9 kcal, to indian beef with almond sauce weighing in at 50kcal per spoon. Dinner at Siam Thai is highly recommended. For a taste of Thailand, try the steamed crab meat and prawn mousse in shell, at 84.1kcal or the yummy Tung Thong – steamed thai prawn dumplings at 139 kcal. Not forgetting desert – the cacao/banana protein ice cream is delicious and a mere 110kcal! There’s SO much to do around the resort but make sure you try one of the healthy cuisine cookery classes – you’ll learn how to change authentic Thai cuisine into healthy Thai cuisine that you can make at home. Also the local market & organic garden tour is a must – you’ll discover Hua Hin’s local food markets and enjoy a tour of Chiva-Som’s wonderful organic garden. This retreat is perfect for those experiencing Chiva-Som for the first time or who aren’t sure what to choose. Upon arrival, your Health and Wellness Advisor will guide you through our menu of treatments and activities to map out your journey with us, based on your objectives. Whether it’s pure relaxation or a lifestyle transformation, we are here to make your entire experience truly fulfilling. In addition, on each day of your retreat, you can select a treatment of your choice from our daily menu. This fully personalised retreat guides you through the art of balancing macro and micronutrients with herbal and nutritional supplements to soothe and cleanse your body. Treatments such as Lymphatic Drainage and Colonic Hydrotherapy will support your programme and you’ll learn which foods aid your digestive and metabolic systems to enable optimal health. Our extensive experience will ensure your detoxification is safe and effective. In addition, on each day of your retreat, you can select a treatment of your choice from our daily menu.